Undoing Border Imperialism combines academic discourse, lived experiences of displacement, and movement-based practices into an exciting new book. 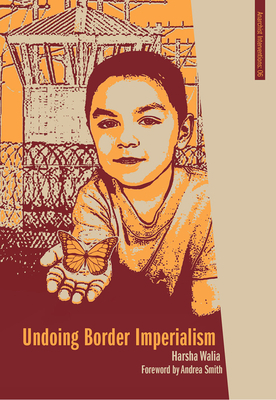 By reformulating immigrant rights movements within a transnational analysis of capitalism, labor exploitation, settler colonialism, state building, and racialized empire, it provides the alternative conceptual frameworks of border imperialism and decolonization. Drawing on the author's experiences in No One Is Illegal, this work offers relevant insights for all social movement organizers on effective strategies to overcome the barriers and borders within movements in order to cultivate fierce, loving, and sustainable communities of resistance striving toward liberation. The author grounds the book in collective vision, with short contributions from over twenty organizers and writers from across North America. Harsha Walia is a South Asian activist, writer, and popular educator rooted in migrant justice, Indigenous solidarity, Palestinian liberation, antiracist, feminist, anti-imperialist, and anticapitalist movements and communities for over a decade. She has most recently been affiliated with No One Is Illegal, South Asian Network for Secularism and Democracy, Women's Memorial March Committee for Missing and Murdered Indigenous Women, Downtown Eastside Is Not for Developers Coalition, and the Olympic Resistance Network. She is the cocreator of a short film, and her writings have appeared in thirty academic journals, anthologies, magazines, and mainstream newspapers as well as on alternative Web sites. Andrea Smith is an intellectual, writer, and activist. She cofounded INCITE! Women of Color Against Violence and currently teaches as University of California, Riverside. She's author of Conquest and editor of The Color of Violence Contributors include Yogi Acharya, Carmen Aguirre, Tara Atluri, Annie Banks, Mel Bazil, Nazila Bettache, Adil Charkaoui, Yen Chu, Karen Cocq, Jessica Danforth, Ruby Smith Diaz, Nassim Elbardouh, Craig Fortier, Harjap Grewal, Mostafa Henaway, Freda Huson, Syed Khalid Hus- san, Jane Kirby, Aylwin Lo, Karla Lottini, Alex Mah, Robyn Maynard, Graciela Flores Mendez, Cecily Nicholson, Leah Lakshmi Piepzna-Samarasinha, Toghestiy, Sozan Savehilaghi, Mac Scott, Lily Shinde, and Rafeef Ziadah.